Companies often outgrow the size of the fields in their databases, which requires a field expansion project. Field resizing creates numerous changes throughout an application. It affects fields in many files and cascades through variables across numerous programs. There are many exceptions and code-related problems that affect the scope of the work that needs to be done. As a result, attempting to perform field expansion manually for anything but the smallest databases is next to impossible. Taking an automated approach with X-Resize removes the risk of human error and ensures a rapid, accurate outcome. X-Resize provides all of the tools necessary to identify and help resolve issues at all stages of the resizing project. 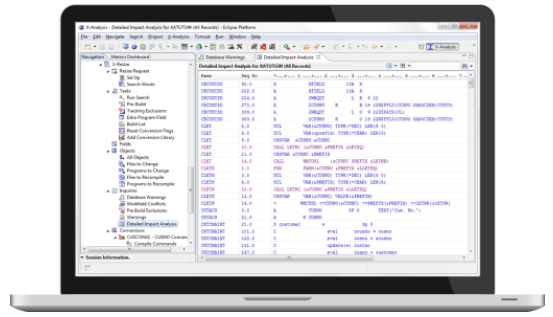 X-Resize generates a comprehensive suite of reports and drill-down inquiries that identify any system components that may be affected by changing a field definition. It provides a detailed impact assessment pre-conversion, eliminates guess work and automatically handles all aspects of the resizing task. In addition, the tool provides exception reports for overlapping fields, screen size restrictions and other issues.